AD 152: On order of the Emperor Augustus, the Roman army has pushed beyond the old border of northern Britannia and has conquered large parts of southern Caledonia. Yet the area remains unstable, and raids are frequent. The men of Marcus Florius Corvus' cohort have to be constantly on guard, and there is little time for leisure, let alone love. This doesn't keep Vina from dreaming of Lonan, the standard bearer, the man who wields the draco like no other in the military games. But she is the prefect's daughter and thus the one woman Lonan can never have. 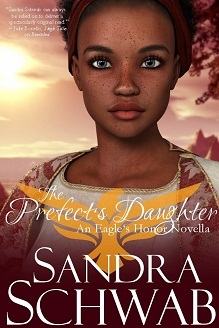 Yet when one day Vina is kidnapped by Caledonian tribesmen, all rules are off and Lonan will risk everything - his career, his very life - to save her and bring her back home.